What a bloke. He exudes this charming persona but with a humble personality. Sharply dressed too for his era. That doctor-educationist (intellectual) look, could be a kind lawyer (his oscar winning performance in To Kill A Mocking Bird as Atticus Finch, the lawyer who championed against racism and prejudism). Those throaty fatherly voice and those intense yet kind eyes. Apparently my boyfriend named him as one his favourite male actors both for talent and for that salt-of-the-earth masculine look. I have only started to really appreciate hollywood film noirs and all those movie legends of 50s, 60s and 70s during my PhD studies (2001-2005). While some oldies were a bit too melodramatic and too good to be true (out of this world), they have set some standards of what films today are all about. (which reminds me of Alfie's favourite quote(Michael Caine classic, 1966) : "what is it all about?"). Watching To Kill the Mocking Bird (adapted from one of the 20th century's most popular novel of the same title by Harper Lee) for the first time didn't do much to me as I knew the storyline already. But when i saw it for the 2nd and the 3rd time, i could feel how simple the movie was made yet with strong castings led by Gregory Peck himself, it remained in my mind as one of the excellent movie adaptation of all time. Malaysian movie scenes during 50s and 60s were much influenced by the indian movies. As a matter of fact, most of the directors and/or producers were either of northern or southern indian origins. We have our local heroes like P.Ramlee, Ahmad Mahmud, Nordin Ahmad, Yusof Latif, Salleh Kamil, Aziz Satar, S.Shamsudin, Haji Mahadi, Jins Shamsudin and heroins like Latifah Omar, Zaiton Hussein, Saadiah, Umi Kalthom, Normadiah, Rose Yatimah, Siput Sarawak and Sarimah, and we glorify and admire their talents, charms and beauty. All have become part of our local film industry. Yet, in malaysia, not many of us are interested to watch hollywood oldies, except if they have lived overseas for quite some time or they just happened to want to see marilyn monroe, james dean or young elizabeth taylor doing their classic stuff. I used to read names like Steve McQueen, John Wayne, Lauren Bacall, Humphrey Bogart, Ingrid Bergman, Cary Grant, Rita Hayworth, Fred Astaire, Katherine Hepburn, Richard Burton, Marlon Brando, Audrey Hepburn, Marlene Dietrich, Grace Kelly, Rex Harrison, Kirk Douglas, Tony Curtis, Jack Lemmon, Walter Matthau, James Coburn, George Peppard (i knew him 1st on The A-Team), Clark Gable, Peter O'Toole, Vivien Leigh, Anthony Quinn, Julie Andrews and so many more hollywood screen legends (dead or alive) including Gregory Peck, of which some i knew their faces and some i hardly even know they existed before. But as i learnt to watch those oldies normally on ITV, Channel 4 and Channel Five, I found it hard not to miss them. Thank god for www.imdb.com site that i could actually obtain some info on these people besides the exposures from movie talk shows and greatest actors, actresses, movie list of all time documentaries on Channel 4 back in the UK. Dont call yourself a movie buff if you dont know jack about classical movies. I just came across "Most emailed News Stories" on My Yahoo! and i found this interesting news that should be an inspiration to many companies around the world, including academic institutions and hopefully the governmental offices to adopt this method for their working mothers employees. Just click the entry's header for more info on the article. Abbott Laboratories, Abbott Park, Ill.
Accenture Ltd., New York, N.Y.
Arnold & Porter LLP, Washington, D.C.
Avon Products Inc., New York, N.Y.
Baptist Health South Florida, Coral Gables, Fla.
Bon Secours Richmond Health System, Richmond, Va.
Booz Allen Hamilton, McLean, Va. The Boston Consulting Group, Boston, Mass. Bristol-Myers Squibb Co., New York, N.Y.
Bronson Healthcare Group, Kalamazoo, Mich.
Children's Memorial Hospital, Chicago, Ill.
Citigroup Inc., New York, N.Y.
CJW Medical Center, Richmond, Va.
Colgate-Palmolive Co., New York, N.Y.
Credit Suisse Group, New York, N.Y.
DaimlerChrysler AG, Auburn Hills, Mich.
Deloitte & Touche USA LLP, New York, N.Y.
Deutsche Bank AG, New York, N.Y. Discovery Communications Inc., Silver Spring, Md. Eli Lilly & Co., Indianapolis, Ind. Ernst & Young LLP, New York, N.Y.
First Horizon National Corp., Memphis, Tenn.
Ford Motor Co., Dearborn, Mivh. Genentech Inc., South San Francisco, Calif.
General Electric Co., Fairfield, Conn.
General Mills Inc., Minneapolis, Minn.
Goldman Sachs Group Inc., New York, N.Y.
Grant Thornton LLP, Chicago, Ill.
Gurwin Jewish Geriatric Center, Commack, N.Y.
Hewlett Packard Co., Palo Alto, Calif.
HSBC USA Inc., Prospect Heights, Ill.
Inova Health System, Falls Church, Va.
JPMorgan Chase & Co., New York, N.Y.
KPMG LLP, New York, N.Y.
Lego Systems Inc., Enfield, Conn.
Lehman Brothers Holdings Inc., New York, N.Y.
Massachusetts Mutual Life Insurance Co., Springfield, Mass. McGraw-Hill Cos., New York, N.Y.
Merck & Co., Whitehouse Station, N.J.
Mercy Health System, Jamesville, Wis.
MetLife Inc., Long Island City, N.Y.
Morgan Stanley, New York, N.Y.
Northern Trust Corp., Chicago, Ill.
Northwestern Memorial Healthcare, Chicago, Ill.
Novartis AG, East Hanover, N.J.
Pearson PLC, Upper Saddle River, N.J.
Pfizer Inc., New York, N.Y.
Pillsbury Winthrop Shaw Pittman LLP, New York, N.Y.
PNC Financial Services Group Inc., Pittsburgh, Pa.
PriceWaterhouseCoopers LLP, New York, N.Y.
Providence Alaska Medical Center, Anchorage, Ala.
Prudential Financial Inc., Newark, N.J.
RSM McGladrey Inc., Bloomington, Minn.
S.C. Johnson & Son Inc., Racine, Wis.
Scripps Health, San Diego, Calif.
Turner Broadcasting System Inc., Atlanta, Ga.
Union Pacific Railroad, Omaha, Neb. Verizon Communications Inc., Bedminster, N.J.
Wells Fargo & Co., San Francisco, Calif.
West Virginia University Hospitals, Morgantown, W.Va. Even though i am not married yet, i have thought about it many, many years ago when it comes to having family in the future. I could somehow envisage myself as a possessive mother and a worrier one too, and because of that, i would somehow prefer to have my children as near to me as possible, as in walking distance or nearby office block, while i am working. I used to think of inventing a safe but also quiet baby cot system equipped with wireless radio transmission of higher wavelength frequency to be connected to a special pager so i would know when my baby needs feeding and all without creating a whole lot of earth-shattering noises while i carry on with my works. And if i am in the middle of some very important meetings/lectures/seminars/conferences/and so on, I could actually send a message to the carers/child-minders/day-care matrons on the to-do things and so on. In addition, they could reach me easier too whenever certain (possibly delicate) issues arise regarding my kids, especially when they are feeling poorly. In Malaysia, i seldom see this trend practised in many companies in KL and even around klang valley. This includes the academic institutions. Well, some universities do provide nearby day-care centre but only for those kids of 3 years old and above. Many malaysians send their young ones to some licenced as well as non-licenced nurseries/childminders, and some prefer to hire bibik (a term used to address indonesian maids) to do the nanny job on top of doing the house chores and cooking. Otherwise, they left the caring job to their old mothers. I do know that a lot of big companies tend to have their own private gyms as one of the attractions, which supposedly to allure the younger,more energetic employees to work there. Somehow, they forget that this younger generations will soon be thinking of having their own families and such consequences will end up a burden to the mothers mostly. And in the essence of that, they forget that their female employees would end up a mother one day. Do i sound broody enough to you? I like kids but i am not too keen on them. I am OK to layan them but not to the extent of too excited or too motherly. But i do know that if one day I will have kids of my own, I will definitely strive for the best for them. More and more bright women with promising futures in their professional fields struggle between raising their family and job. I see some of my female doctor friends opted to do locum instead of full time practising doctors just to attain flexible hours. Those who prefer to climb much higher corporate ladder or those who are ambitious in any respective profession, would either discharge the idea of getting married or if they are married, having children is out of question. A few of the married ones ended up in divorce due to career constraints and demands. Such is already fast becoming a popular trend especially in the western countries. On a total 180 degrees flip side, more than half of those women in the arab gulfs and indian subcontinental become a fulltime housewives as that is encouraged in their society despite holding a university degree. In Pakistan for instance, such practise has become a norm that the ladies hardly find it strange when their husbands decided that home is their place. Not only have the ladies gone through arranged marriage, they are also arranged to be domesticated. My male pakistani friends, when asked about this tradition, seemed to be all agreed that it may be the best method to secure marital harmony and societal balance. Good thing in Malaysia, muslim women have secured much better positions and are given more freedoms of choice to pursue with their lives (and destiny, ultimately). Amazingly, many of the successful ones are those with children (some even have 8 or 9) and still married. OK, some of their husbands practise polygamy but most are monogamous at best. It must be due to the islamic teachings and eastern moral cultures that they somehow managed to bring up their children in a more apt surroundings while still managed to become high flyers, the so called movers and shakers of their companies/institutions/government offices/etc. But of course, it takes two to tango. Behind a successful malaysian muslim woman is a doting, loving and equally or maybe even more successful husband. I see a professor-couple (both husband and wife are professors in science and engineering) with nine children, and almost all their children grew up properly and followed their parents step by doing well in their studies. This is just one example out of tenth of thousands more of them in Malaysia. I reckon Lynette Scavo (Desperate Housewives character played by Felicity Huffman) has inspired many high-flying working mothers around the world on the importance of tackling family issues while still able to carry on with their job. 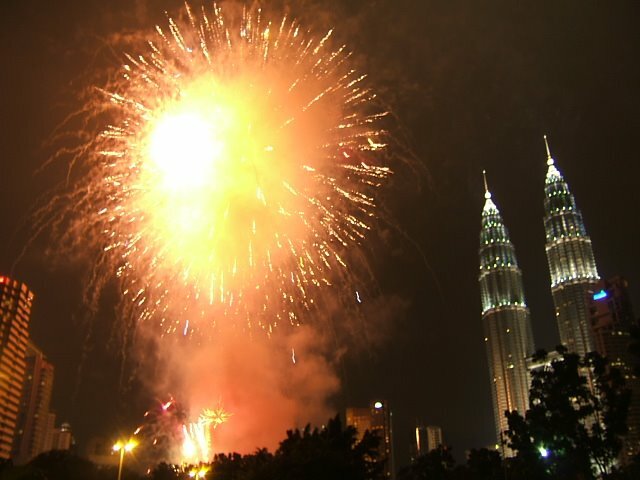 Ramadhan is back and now I am observing it in malaysia once again after almost 5 years of practising the fast and glorifying this month in london. To be honest with you, this holy month of Ramadhan is the month where i really, really feel like closer to God than the rest of the other months. It is the time when I get to contemplate about so many things in life with respect to my faith. It is when i feel more spiritual, more pure and more decent. Ever since i took a vow, or almost like a vow back in 2000 that i shall be more serious and more committed when it comes to glorifying the month of ramadhan, alhamdulillah, thank god, it has taken me into different level in terms of the ease and convenience in exercising all the obliged ibadahs. I dunno how to explain it in words...it's just indescribable the feelings i have when Ramadhan has arrived. The more i learn about myself, the more i know what i've sinned and all, the more i am looking forward to Ramadhan to redeem myself before God. I know that we should stay consistent when it comes to practising the ibadah throughout the year. That should be so true according to the islamic teachings. After all, that is what is demanded from us muslims. However, knowing my weaknesses and etc etc, i feel that it is during Ramadhan that i shall fulfil many of the obligations ever more sincerely. And that is what made me do such vow 6 years ago. This is the month when I feel more motivated to read the Quran. And inshallah, God's willing, this is also the month that one day I hope to meet my Creator when my time comes. Last night, i saw half of this old movie: Arabesque featuring Gregory Peck and Sophia Loren. 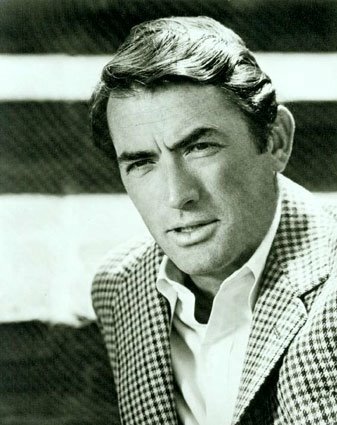 I was not really aware of this Gregory Peck fella much until my boyfriend recommended me to watch To Kill A Mocking Bird on his videotape and to read his book of the same title as well somewhere at the end of 2004. Then i remembered him in the original The Omen (1976). Few months ago I saw The Guns of Navarone on the telly and he's the protagonist. 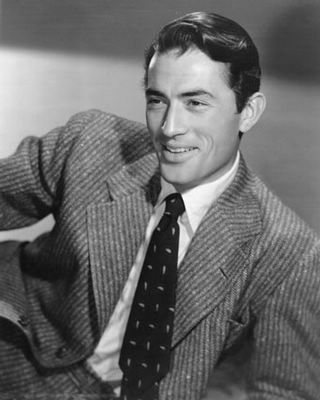 Always the good guy in most of his movies, about the same like Cary Grant and Tom Hanks, just to name a few examples of Hollywood's good guys persona on the silver screen. 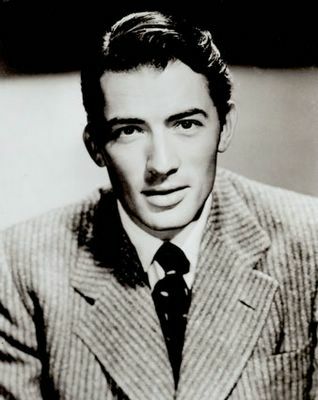 The more i see Gregory Peck in his movies, the more i adore him. I will post his photos later in my next postings. 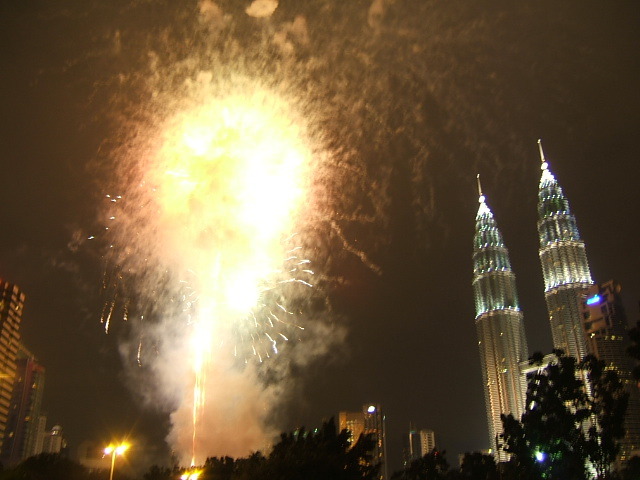 This is my first time ever to go out and do the Merdeka countdown on the eve of merdeka day (31 August every year). 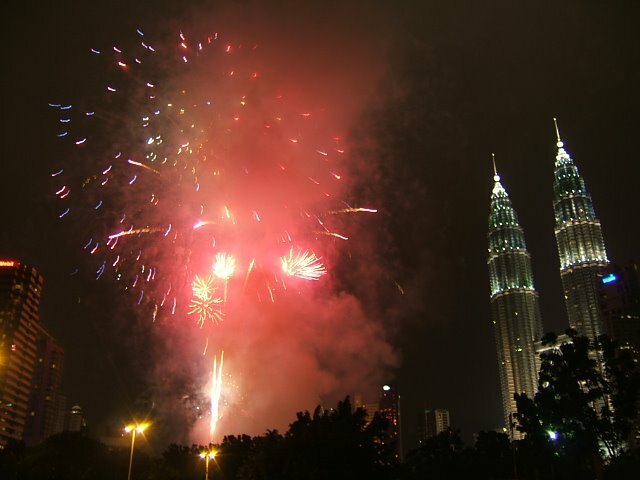 My friends (well, it's abang ibrahim's family, him, his wife kak zu and daughter hakimah) and I chose the nearest but less crowded spot nonetheless, to see those fireworks display right after the midnight countdown. It was awesome really to be amongst thousands other city dwellers to watch this historical event. 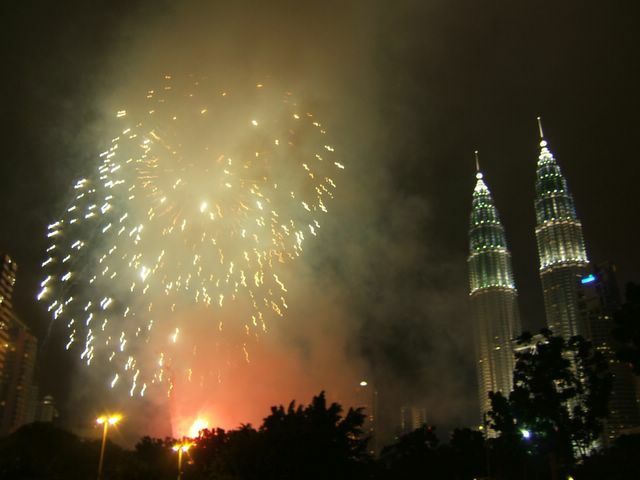 After all, it's our 49th independence year celebration. 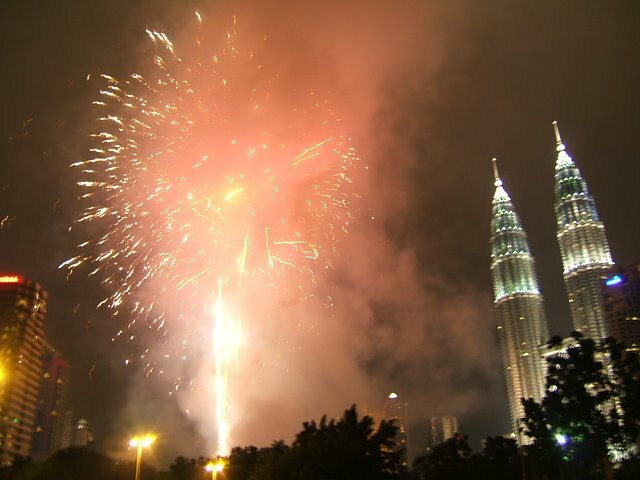 Although that might not be exactly the honourable way of remembering our forefathers' struggle to free Malaysia from its colonial, British, i did feel patriotic and proud to be Malaysian. I reckon it is what and how we feel that matters the most. An evening to remember: counting down towards merdeka moments near Petronas Twintower aka KLCC. 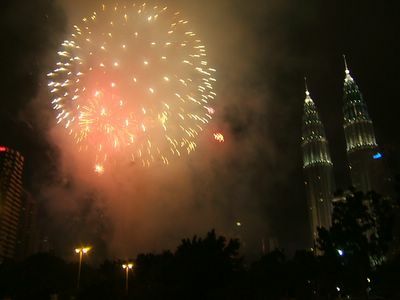 And what a great view these fireworks!! what a waste of money, but heck, this is a great firework display! Just a short but interesting story i encountered today. I then continued packing my stuff up and locking up my room when i saw this pitiful looking cat sitting on a desk next to our coffee room. She didn't stop meowing when she saw me heading towards her....arrrghhh that untamed, scruffy cat, the one who gave that hissssssss warns whenever i came near her....OK FINE, what is the problem, cat??? i said in my heart....I dunno why but those perikemanusiaan (humane and compassionate) instincts made me walk over and investigate on her strange behaviours. Then i heard another loud but higher frequency meows coming from our coffee room. Right. It was locked. Now i understood. Her kitten accidentally left trapped inside. Mother cat still staring at me, as if she asked me to do something about it like maybe try to let her baby out. I was actually curious to see as to how far could she be serious that it was indeed her kitten. As if she understood what i was thinking, she continued making all that noise to prove that she was obviously desperate to see her kitling again. Fair enough. So i opened the coffee room door, switched on the lights and waited for the kitten to come out. That little bugger kept on meowing, i guessed for help maybe, as in telling her mama that she's in there, come and save her or something. I looked at the mother and said to her, "meh sini, masuk cepat, sini!" (come here, go inside, here!) Without further ado, she came down from the desktop and crept slowly while precautiously ensuring some certain safe gap between me standing and holding the door and the space for her to make her move. Bloody brilliant ugly old stray cat, you. So off she went, and immediately she located her baby. Both came towards each other, brushing against their heads and bodies . Ahhh....mama and baby reunion. Well, hold on you two, i need to go home now, I'm knackered and famished. Since she did understand my first orders, i thought i should start commanding her to leave our coffee room now. "Dah, dah, cepat kua, kua...kua laa woi....kucing, kua laaa!" (enough, enough, move out, fast...out out out laaa oi). The next thing i saw was that mother cat beginning to move slowly, heading towards the exit and halted approximately a metre away from me. I reckoned she's signalling her kid to follow her as the coast was clear. I just stood there holding the door when that kitten then came out from under the small table (where it has probably been hiding all these while) and gingerly running towards its mother. Off they ran a few yards away from me as i closed the door. I turned to look at them, joyfully rubbing each other. A few seconds later, they stopped and turned around looking at me and meowed. Then they moved further down the corridor and made another brief stop to look at me, and meowed. My only sincere guess was that they actually thanked me for my help. They probably are inhabiting in an alley somewhere, or running a vagabond life, moving around scavenging for leftover food and what nots. They may look not that healthy, no fancy thick furs covering their body. However, regardless of their shortcomings, they seemed pretty much surviving. I learnt a good lesson today on the importance of being grateful to what we have despite how relatively modest it can be. But above all, I am truly amazed at how "streetwise" those cats were to the extent that they could actually understand our lingo. Many are the Jinns and men we have made for Hell: They have hearts wherewith they understand not, eyes wherewith they see not, and ears wherewith they hear not. They are like cattle, nay, more misguided: for they are heedless (of warning).